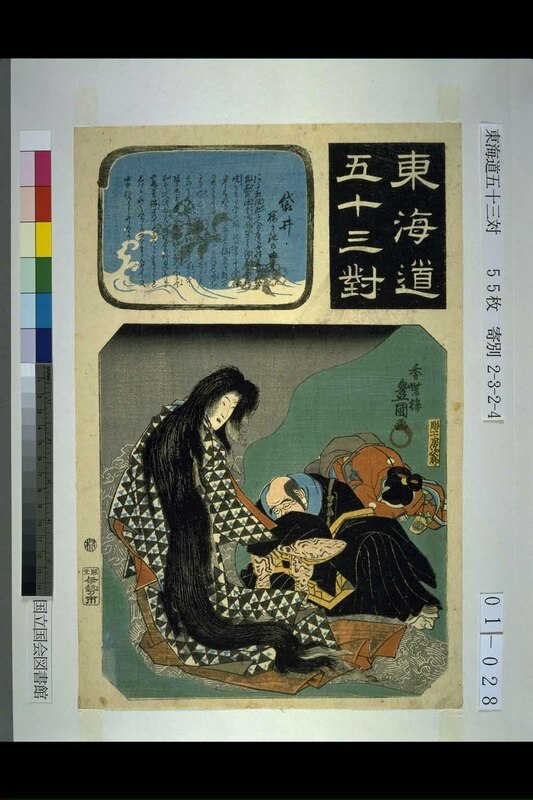 There are nine prints from this series, Fifty-three Pairings for the Tōkaidō Road (Tōkaidō gojūsan tsui - 東海道五十三対), in the Lyon Collection. See also #s 815, 819, 861, 951, 1022, 1095 and 1269. 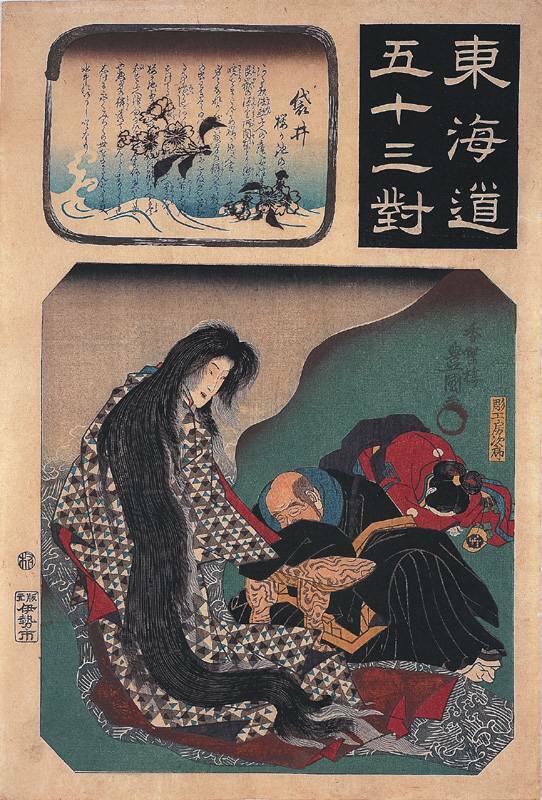 A fantastical creature in the shape of a woman appearing before a sleeping or praying Hōnen shōnin and his assistant. Hōnen (法然: 1133-1212), the founder of the Pure Land school in Japan, had originally studied at Hieizan with the monks Genkō and Kōen. However, he left there to study elsewhere because he decided that the Tendai sect had become corrupted. The story of the Cherry Tree Pond (Sakura-ga-ike: 桜か池) is related in The Dragon in China and Japan by M.W. de Visser on pages 186-7. "According to a modern work, the Nihon shukyō fūzoku shimentioned above, there is in Kasahara village, Tōtōmi province, a pond called 'Sakura ga ike', 'Cherry-Tree Pond'. It is the abode of a huge dragon, to whom those who have a special wish pray on the middle day of higan (彼岸, 'yonder shore', a period of seven days in either equinox; the middle of the day is equinoctial day), at the same time making an offering to him consisting of a bucket of hard boiled rice (kowameshi, 強飯, 'red rice', rice boiled with red beans), which they cause to float on the water. If they afterwards find the bucket empty, this is a sign that the dragon this is a sign that the dragon has eaten the rice, accepting the offering and hearing the prayer, but if the rice is still in the bucket, the prayer will not be fulfilled. This dragon is the reincarnation of the Buddhist priest Genkō, 源皇, a Tendai priest of Hieizan, a teacher of Hōnen shōnin, 法然, who lived 1132-1212. Genkō wished to become a dragon, because his life was too short to obtain a sufficient knowledge of Buddha's doctrine. One day he heard from one of his disciples that the above mentioned pond was an excellent place for a dragon to live in. Then he sat down in religious meditation (samādhi), put one drop of water in his hand, by means of which he made clouds and rain, and flew through the air to the pond. There he died in meditation, and when his disciple came and called him, an enormous dragon appeared above the water and wept. At the pupil's request he assumed his former human shape and talked with him for a long time." There is an unidentified Japanese collector's seal in left margin. Also, there is another copy of this print in the National Gallery, Prague. 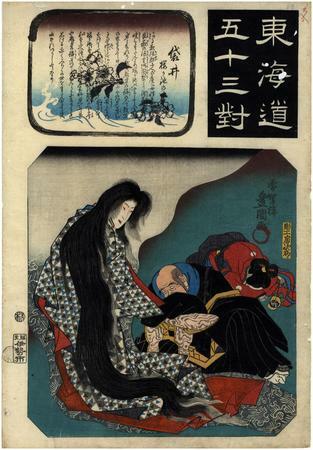 Illustrated in color in Kunisada's Tōkaidō: Riddles in Japanese Woodblock Prints by Andreas Marks, p. 104, #T78-28. There is another copy of this print in the Harm Museum at the University of Florida.